Koushlya Bai is a waste-picker from Indore, associated with Janvikas Society. She is participating in the exchange of the Global Alliance of Waste Pickers, as a representative of Alliance of Indian Wastepickers. The meeting is hosted by the recyclers branch (Federación Argentina de Cartoneros, Carreros y Recicladores: FACCyR) of CTEP, a popular workers national union in Argentina. 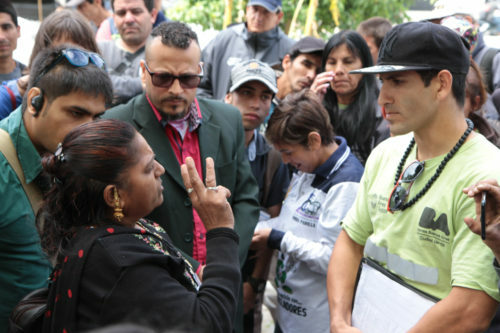 She is learning how wastepickers have been integrated into Buenos Aires city’s waste management. While doing so, she is constantly comparing the situation at home. Indore has been awarded as the cleanest city in India by Swachh Bharat Surveykshan (Clean India Survey). The city of Indore is clean, yet its wastepickers have been marginalized. Swachh Bharat Abhiyan (Clean India Movement) guidelines mandate inclusion of wastepickers. Very little has happened in that regard in Indore. When she was told that wastepickers in Buenos Aires get a monthly social assistance of 6,000 pesos (INR 13,000). There are other wastepickers, who get the salary of pesos 11,000 (INR 24,000) from the municipal corporation for doing door to door collection of dry waste, plus the dry waste is theirs, the wastepickers have a right to mobility, where they can travel in public buses for free. She immediately asked, why are we not having such a system in Indore. In Indore, the wastepickers right to access dry waste is restricted. Only some wastepickers are allowed to retrieve waste from the dumping ground and they too have to sell it to the dealers, who have set up shops near the dump-yard. They never get a good price. If they complain to municipal authorities for low prices for retrieved and sorted material, they are not allowed to enter the dump site again. She shared the story of their struggle with wastepickers from all over the world and stated that Swachh Bharat Abhiyan (Clean India Mission) or any such programme in any country is incomplete without wastepickers included and their right to dry waste recognised. She shared that they are asking for wastepickers (one waste-picker per truck) to go along the truck, they can take the dry waste during the collection, later sort and send it for recycling. Currently, the dry waste is taken to dump yard and wastepickers are asked to retrieve the waste, once it is dumped. Further, wastepickers should be given INR 5,000 for dry waste collection from door to door, when they go along with the trucks.